Vote for SEAArch in the Blogger's Choice Awards! 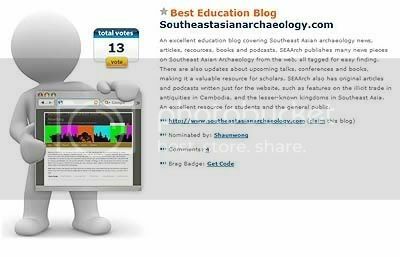 Dear readers, SEAArch has been nominated for the Best Educational Blog category in this year’s Blogger’s Choice Awards! The awards recognise blogs that are making an impact in the blogosphere, and voting is now on until October. I hope you will show your support by casting your vote for SEAArch in the Blogger’s Choice Awards! Some registration is required in order to cast your vote (to prevent instances of cheating, I guess) but the whole process should take about 10 minutes.